7 Reasons Why Kuddly Will Rock Your World! Some time in 2014 the start of Kuddly began to formulate in a southern California garage. The idea, birthed from all three co-founders yet inspired by CEO of Kuddly, Joshua Hong. His wife who is an avid lover of cats, especially her two Persians, Kenny and Chuchu likely inspired the idea. 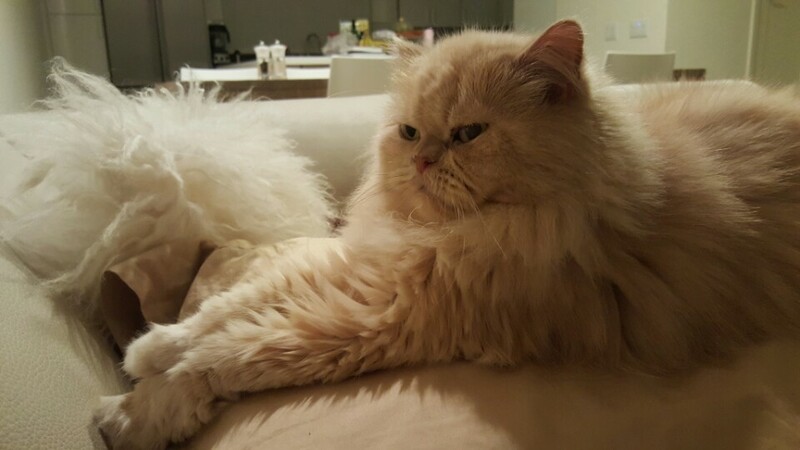 Kenny, 12yrs, 2015. Chuchu could not appear today because she was hiding, as usual! “I’m allergic to cats, actually. I sneeze and get a runny nose. But for my wife, I compromised.” And here at our office, everyone describes Kenny as the social yet paranoid-type who foams at the mouth if you even bring a cat-carrier in his sight. Chuchu is anti-social and only appears if you walk slowly, avoid sudden movements, speak in Korean, and you happen to have a treat in your hand. On July 1, 2015 Kuddly begin targeting the recruitment of veterinarians, and later consumers. It’s goal? To solve Kenny’s dilemma and the dilemma of every other pet and pet owner out there: can I just ask the vet a quick question without having to hop in my car or make an appointment? 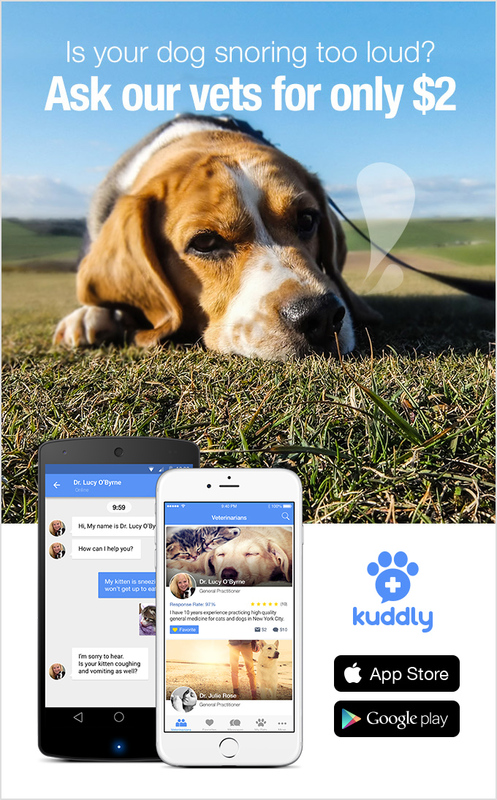 At Kuddly we believe we’re working to make pet wellness more accessible to pet owners. We aren’t looking to eliminate the need to go into the veterinary clinic, but rather we are looking to bring affordable, high quality and synthesize information right to the fingertips of every pet owner. We believe information that’s left for pet owners to interpret on google or petMD has the potential to leave pets in suffering, or pet owners anxious and confused, when they don’t have to be. There’s no way to sift through all of the data on the web and seriously make an informed decision about our pets health. We can’t play “Dr. Veterinarian” from a search engine and our pets deserve better. We’ve compiled a few reasons why Kuddly’s going to help keep your pet’s wellness in line, save you money, and reduce the stress associated with multiple veterinary visits, all while improving the health and well-being of your pets! In April 2015, the Youtube world watched Loki, a young Siberian Husky suffer through the effects of Marijuana. If you haven’t seem the clip, it is a bit disturbing. Loki, got into large amount of marijuana and the owners state in their description that they called their vet-friends. Not every pet owner happens to have a veterinarian as their best friend, but if you’ve got Kuddly, then you’ve got hundreds of vets at your finger tips, ready to answer any questions. There’s coughing, sneezing, diarrhea, and any other number of symptoms that could suddenly impact our furry or not-so-furry friends. Sometimes our local vets don’t have any helpful information for us regarding birds or fish or little Timmy’s pet tarantula. Kuddly does allow you to send videos, voice notes, and images to get the answers to your questions or better yet, even more resources. Whether you’ve got an American shorthair, Siamese, a German Shepherd or a Mastiff, there are pet breeds and specific traits more susceptible to certain ailments and illnesses than others. But, with that knowledge, you don’t have to stop there. You can inquire with a vet to learn more about preventive measures you can take between your scheduled visits or when changes arise, to keep your pet well. Is your pet doing something that’s got you concerned? Circling? Sometimes pet behaviors in cats are often ignored because, to put it simply, cats are preying animals and showing a disposition of pain is not beneficial (according to the way they’re wired). The same is quite similar for dogs, they may be in distress, but you’ll likely not pick up on it as quickly. When you’re alerted to these concerns, but perhaps think they’ll be fine, a professional opinion could be the best for you and your pet. How about having veterinarians available for your 24/7/365? We are amazed at the plethora of information provided to us by search engines online…the information is an amazing part of our contemporary lives. However, interpreting that information with minds trained in fields outside of animal/pet well being can leave the floor open for concern. Image comparisons and symptom-matching techniques don’t lead to accurate analysis of your pet’s status, however, having a veterinarian available for you and your pet to look at the same findings could really help you both in the long run. Just like humans, the earlier pet care happens the better off your pet will be. Veterinarians report that the reason why visits to the vet have become more expensive is due to the fact that pet owners have delayed the visit for too long because they didn’t know their pet’s symptoms warranted a visit. For as little as $2 you can get both peace of mind and improve the wellbeing of your pet. At Kuddly, we’re proud to be at the forefront of technology where we can have a helping hand at improving the health and well-being of animals.